Wolf's WPA Military Classic line of ammunition is ideally suited for shooting out of your AK-47. 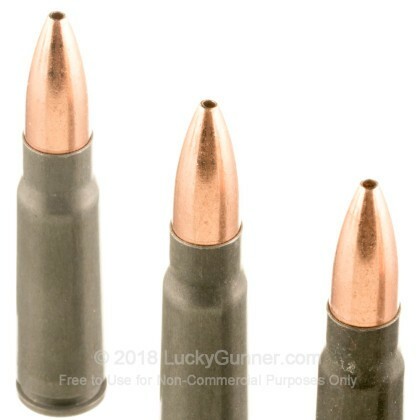 This ammunition is loaded with a hollow point bullet which is great for personal defense, hunting thin skinned game, and at this price, it's great for target practice and range training as well. This ammunition is manufactured in Russia and is Berdan primed, steel-cased, and non-reloadable. Reliable, accurate, comparably clean, and a great bang for you buck. This is an excellent round that delivers every time. 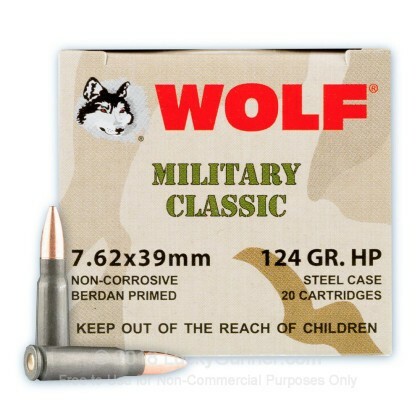 I prefer WOLF generally to its other steel casing competitors, and while other WOLF lines are reliable, this particular round, the MILITARY CLASSIC HP stands out. Luckygunner, of course, handled shipping and delivery quickly and safely. My Sig 556R 7.62 with x3 scope cp1 @100meters makes1.5 inches group, good enough for combat fire. Fired 500 rounds- no single complaints. Super fast shipment. LG got my business. I've only shot about 200 rounds, but the ammo cycles well. It wasn't the best price I've purchased this at, but it was a good deal overall. So far I am very pleased with my purchases from LuckyGunner.com. Shoot 200 the day after receiving ammo. 100% good. I have ran a more high end ammo thru my Arsenal Sam7 ak47 thinking I'd get better accuracy. Long story short, the cost was killing me! Ordered 1000 rnds thru lucky gunner of WPA! Love it and noticed no real difference performance. Saved a bundle and will never go back! Will use Lucky Gunner for all my ammo needs! Loaded up on cheap AK ammo and have not had 1 issue with it. This is the stuff for you if you want target ammo at a great price. Thanks Lucky Gunner. Great ammo, great price, great service! Both AK and SKS eat this stuff up, leaving a lot of leftovers. Dirty ammo insures your weapons are always cleaned afterwards, as should be automatic. Accurate to 100m or so, no misfires or jams to speak of, cant beat the price anywhere. Stock up now in case "King" Obama gets his way and bans ammo, since he can't ban guns! Ammo is good stuff!!! So is Lucky Gunner!!! Both AK & Yugo SKS "LOVED IT!" Good Grouping @ 70 & 100 yards! Dirty but I clean my weapons every time I Range Shoot. Cycled 500 rds. Fed smooth with no jams! I have been with LG about 3 yrs. Best Internet Ammo business going! Thanks Heidi & gang! First time buyer. Won't be last. Ammo performing exactly as you would expect it to. Went thru 500 rounds this weekend without a single hick up. Can't wait until next the next time when I get to go shoot some more. Great ammo, great price and great service. My AK 47 loves this stuff. Always a pleasure doing business with Lucky Gunner. This Wolf WPA MC - 7.62x39 - 124 gr HP -1000 Rds. is much better than I thought it would be. My SKS LOVES IT!!! 200 rds. No mis-fires, jams & a fairly good grouping @ 100 yds. I was eating up 8" paper plates. Only 4 Rds. unaccounted for. That could have been my fault because I adjusted the front site during this time. Anyway, "I'll be back!" for more. LuckyGunner is my kind of place. If it's available, it shows on the website. If it not available it's not listed. How much easier can it be? The shipping is super quick. I ordered Monday morning. It arrived Tuesday evening! I've been buying from LuckyGunner about 4 yrs. now. Like another reviewer said, I don' check any place else. Keep up the great work Heidi & "the gang"!!!!! My ak and sks love this ammo. 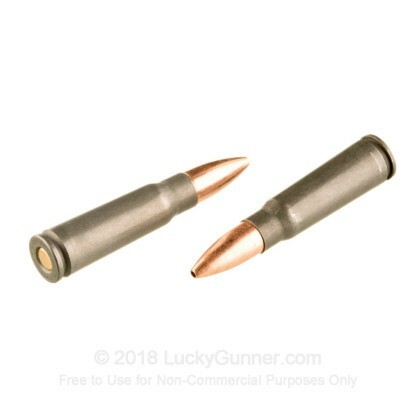 Performs better in my opinion than the Winchester rounds that are four times the price. They are steel cased, but ak's and the sks are designed for that. great groups at 80 yards. 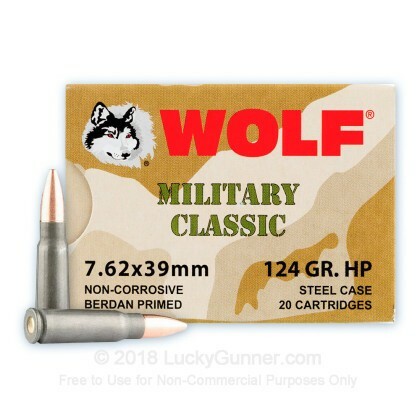 Really Great value ammo, but doesn't appear to be sealed with that red stuff they use on some of the other wolf brands, but weatherproof ammo might get a person in trouble one day, (Thanks Obama!) but all wolf ammo is good stuff so I'm happy! 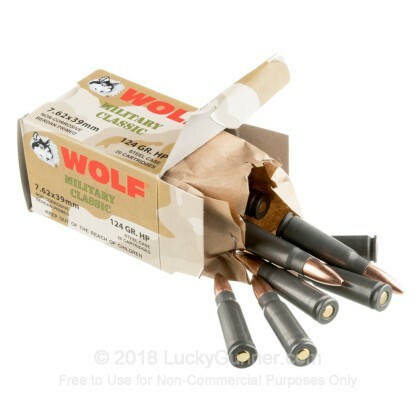 Not a big fan of Wolf ammo because of how dirty it is, however, for the price you can't go wrong. The plus side is that knowing how dirty the ammo is, guarantees that I will be cleaning my gun afterwards which means It will always be taken care of. The price is A++. I love to shoot my SKS and will definitely be needing to buy some more. Product highly recommended. Went to our range out in the country and had a ball firing these Wolf rounds in my SKS's!! Functionality, performance and accuracy were on par for the military imports. Everything about these rounds from online ordering ease to prompt shipping and receiving to condition of the package on receipt was an enjoyment. The rounds are no more 'dirtier' than domestic rounds and fire and feed was flawless. Only downside is Wolf's packaging in the paper, inner container...inside the cardboard box. Now this is aggravation! Again, wonderfull experience brought to reality by LuckGunner!! I would purchase again. 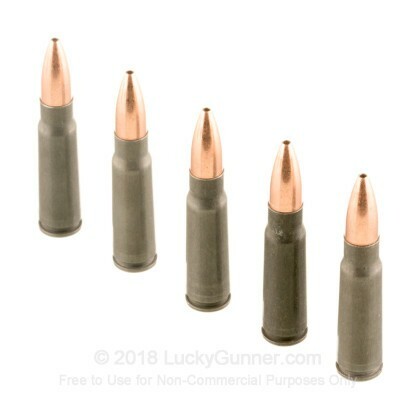 Great ammo at a good price. I will buy from Lucky Gunner again. Q: Are the primers corrosive? A: Wolf loads these 7.62x39 rifle rounds with both non corrosive powder and non corrosive primers. Q: Is this WPA hollow point ammo coated with the polymer to protect it like the FMJ ammo is? A: This is the standard WPA option from Wolf. Our selection of Polyformance ammo from Wolf will include the polymer coating you are interested in. While it does protect ammo from moisture, it also improves feeding to and from the magazine into the chamber of the rifle. Q: Is the jacket all copper and non-magnetic? A: While this ammunition is a copper based jacketed hollow point, this is composed of a bimetal material which will stick to a magnet. This steel cased ammo is Berdan primed and will not be suitable for reloading. We also have this 7.62x39 - 124 gr HP - WOLF WPA MC - 20 Rounds ammo in stock in a smaller quantity.